Screen replacement part for your DIY repair! Cracked iMac screen bumming you out? Replace it yourself and save some money! You have found the perfect fix for your malfunctioning or cracked LCD. If your screen has problems with the pixels, lines or other issues, this part are the answer to all of these problems. Compatibility: Apple A1418 21.5" Desktop computers. This is a brand new replacement screen for the A1418 21.5". 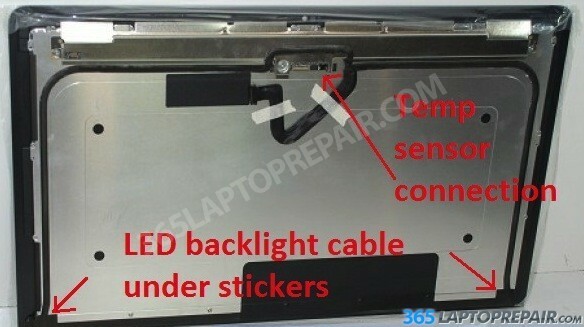 The part number of the LCD is LM215WF3 SD D1 or 646-0796. In this model, the glass and LCD are one complete unit. Earlier years have a glass panel that is separate from the LCD. We include the double sided adhesive you will need for this project. These adhesive tape strips are cut to fit perfectly inside and hold it in place. You will need a heat gun and a prying tool in order to remove the old glass. There is adhesive along the top and sides holding the old glass in place. With some heat and a prying tool you can separate it, but dont insert your tool too far or you might damage some of the insides. See an indepth tutorial in our video to the left or in the link below. You will also need to take the temperature sensor from your old screen and put it onto the new one. You can see in one of the pictures where we have pointed out where the temerature sensor connects to the screen. Need help? Watch our Screen Replacement Tutorial video! It shows you the tips and tricks of how to do the installation! Ready to buy the part and fix your computer? Click the “Add to cart” button above to checkout! We accept credit cards via Authorize.net and PayPal. We offer multiple shipping options for your convenience! Take a look at our video tutorials that show the checkout process if you need help! Watch our Authorize.net checkout video for credit card checkout. If you intend to pay with PayPal you can watch our PayPal checkout video. We also have have an iMac repair service. We will do your repair for only $399! Our certified technicians can also fix any other problem you are having! You can ship us your computer yourself, or we can send you a safe shipping box so you can more easily send it to us. Please get in touch with us with any questions! Click the button below!